KSSL is committed to achieving and maintaining sustainable practices in all aspects of our work. Steel is recyclable and is being promoted to designers because it is sustainable and an environmentally friendly form of construction compared to concrete. 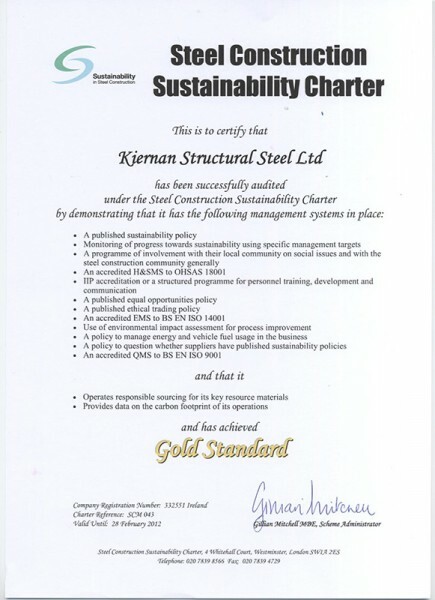 The BCSA promotes sustainability through its Steel Construction Sustainability Charter. In recent times, the larger construction projects are now coming from clients who are looking for sustainable forms of construction and for contractors which operate in a “sustainable” manner. We have completed projects that have scored highly on BREEAM standards such as Pallas Foods, Kerry Foods GTIC and Guinness Brewhouse at St James’ Gate, Dublin for Diageo.